Attorney General Jeff Sessions on Monday clarified his confirmation hearing testimony to acknowledge having spoken twice last year with the Russian ambassador, but he said he stood by his earlier remarks as an honest and correct answer to a question. The filing amends testimony Sessions gave under oath in January when he said he did not have communication with Russians. Sessions reversed course last week and acknowledged that he actually had spoken with the ambassador once at the Republican National Convention last July and again at a meeting in his Senate office in September in the presence of his Senate staff. 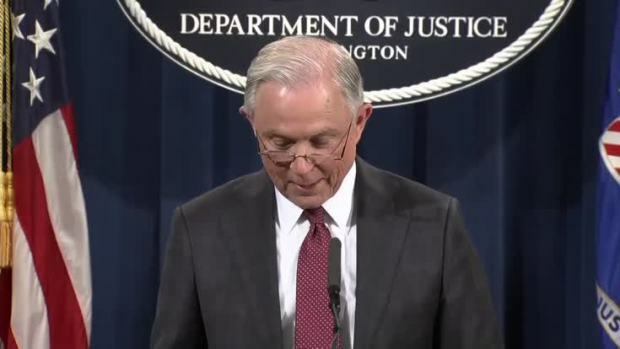 Sessions committed last week to amending his earlier testimony as he agreed to recuse himself from any investigations involving the Trump campaign and Russian interference in the presidential election. He said at the time that he had not intended to be misleading, though he acknowledged that he could have been more careful in his answer. On Monday, in a three-page filing with the Senate Judiciary Committee, he defended his response as honest given the context of the question. "I do not recall any discussions with the Russian ambassador, or any other representative of the Russian government, regarding the political campaign on these occasions or any other occasion," Sessions wrote. Sessions maintained that his answer to a question from Sen. Al Franken, a Minnesota Democrat, was correct. Franken had asked Sessions at the confirmation hearing what he would do if he learned of evidence that anyone affiliated with the Trump campaign had been in touch with the Russian government in the course of the campaign. Sessions responded that he himself had not had "communications with the Russians." He said Monday that he answered the question the way he did because Franken had raised allegations of continuing communication between Trump associates and intermediaries for the Russian government.